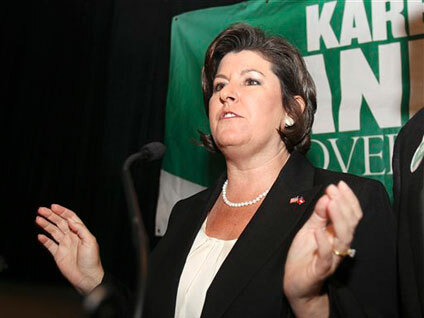 Former Georgia Secretary of State Karen Handel has conceded her gubernatorial primary to former Rep. Nathan Deal. With almost 600,000 votes cast in the Republican runoff election yesterday, Deal led Handel by less than 2,500 votes. In a statement, Handel says she won't request a recount even though she trails by just four tenths of a percentage point. An unknown number of provisional, overseas and military ballots have yet to be counted as well. Deal, who resigned from the House earlier this year in order to run for governor, will now face Democratic nominee Roy Barnes, who served as Georgia's governor from 1999 to 2003. "The best thing for our party is to rally around Congressman Deal as our nominee in the fight against Roy Barnes," Handel said in the statement. "Barnes would return Georgia to a past that is best kept in our rearview mirror. We must marshal all of our resources to defeat him." The race between Handel and Deal attracted endorsements from several high profile Republicans. Deal won the backing of former House Speaker Newt Gingrich and former GOP presidential contender Mike Huckabee, while Handel won the backing of former GOP vice presidential candidate Sarah Palin and Arizona Gov. Jan Brewer. Ned Lamont, Once Lieberman Foe, Loses in Conn.